What is the relationship between menopause and meditation? Can meditation help during this significant life transition? According to holistic health coach Katherine Miller, yes it can. 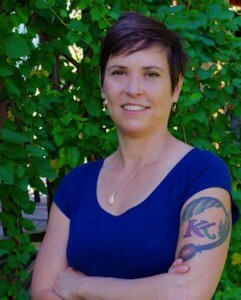 Katherine Miller is a holistic health coach and former meditation teacher and yoga instructor. Recently, she finished hosting a successful global tele-summit called Menopause Is A Trip. Katherine is a long-time meditator and spent two decades doing intensive spiritual practice in a spiritual ashram before starting her own holistic health business. In this episode of The OneMind Podcast, she discusses why and how meditation is such an important tool for women going through menopause. Because too many women are looking for answers and not finding them! Menopause is just as important a transition in a woman’s life as puberty or childbirth. It’s a time of enormous transformation, personal growth and reinvention. So why is the experience of menopause so often awful? Because we come to menopause unprepared, unsuspecting, and at a disadvantage. In the last 60 years our world has changed enormously – we eat processed foods, take antibiotics, live a 24/7 high tech lifestyle, work full time in sedentary jobs, use hormonal contraception, and are exposed to more chemicals in a day than previously known to man. All these things have made our lives easier in many ways, but they have also compromised our health without us even realizing it. Katherine believes that meditation is one of the most important tools for women to manage these changes and nurture their health and wellbeing through menopause and beyond. Why it’s important to go inward during this time and how meditation is a perfect tool to do that. Thid is awesome, it makes so much sense and glad to hear there is a spring that follows winter, what a fantastic analogy Katherine makes. Hello Fiona, So glad you liked it. Understanding this transition in our lives and learning how to take full advantage of it is something I am really passionate about! And meditation is such a beautiful tool for doing that.